In the masterpiece, satiric comedy, The Trials of Brother Jero, Nobel laureate Prof. Wole Soyinka, captured religious hypocrisy in the form of a con, or fraud, named Brother Jero, who preaches to his followers on Bar Beach in Lagos. Brother Jero was an energetic rascal that mastered the art of manipulating his followers in an obedient position by simply convincing them that their quest for money, social status and power will be fulfilled “now”. This play that goes back to 1960s captured the exact replica that is being played out by the fraud and con politician named Atiku Abubakar. The political rascal Atiku have been attempting to convince Nigerians that if elected President, he will feed us from the nose while we relax at the foot of Adamawa mountain. After his selection as the PDP presidential candidate, the con artist wasted no time scouting for endorsement to boost his tattered integrity. His attempt to woo Soyinka and get an endorsement failed. The fraud politician quickly conned Rev Kukah and Sherik Gumi in the “reconciliation” with another rogue, Obasanjo where he manipulated them to be seen to have endorsed the presidential bid. [b]As to Bishop David Oyedepo’s role, I don’t believe he was conned. His appearance was out of pure desperation and corruption. After watching the pictures of David Oyedepo celebrating the reunification of dangerously corrupt men, I wept for Nigeria. It is corruption when Bishops surrenders their integrity, a sense of wholeness and moral character, and basic humanity for the sake of money and power. Bishop David Oyedepo in desperation to regain influence of Nigerian Presidency embraced corrupt Atiku. This demonstration of crude acceptance of corruption should be a source of concern to every Nigerian that is interested in this fight against corruption. Atiku Abubakar’s campaign strategy is to conjure up images of a man who after corruptly enriching himself, invested the embezzled public resources to create jobs. Take, for example, Atiku recently claimed that unlike Buhari, he is “an expert job creator who has founded many successful and thriving businesses including the American University of Nigeria, Yola.” What Atiku intentionally left out was that the reason he cannot go to America is the millions of Dollars he laundered to America for a direct license to use the franchise of the American University. Under Atiku and Obasanjo’s watch, public universities collapsed. Atiku, Obasanjo and the likes of Bishop Oyedepo quickly filled the vacuum by establishing private universities that are beyond the reach of poor Nigerians. Corrupt, short-term gains might be huge, but the human costs of this corruption emerged later when children of rich parents started sending their kids to private schools following the near collapse of public schools. Sadly, the resulting poverty and uneven educational development between the rich and the poor has sharpened the incentives for further corruption. The greatness of a man is not in how much wealth he acquires but in his integrity. Atiku knows clearly well that his integrity is rotten. As a con artist, therefore, he attempted to buy integrity by appointing Peter Obi as his VP. The problem with Peter Obi is that he is a hypocrite that lies with sincerity, but that’s a matter for another day. The unfortunate thing is that many Nigerians, especially the youths that have been lamenting bitterly about the endemic corruption in our polity are suddenly willing to excuse the con artist Atiku from a test of integrity. Their reasoning, all politicians are the same (corrupt) so let’s make sure our side wins. Atiku might be a corrupt idiot, but he’s our corrupt idiot. Ndigbo have a saying that not asking questions before eating causes death without illness. Some Nigerians might reason, why should all this corruption matter to me? One reason is that corruption's connections to poverty are far more numerous and pervasive. Beyond the effect on incomes, corruption undermines outcomes in education, health, public investment, and income equality. It thwarts development, including undermining public finances. So, how bad will the effect of Atiku-era corruption be if elected president? The best guess is worse than you can possibly think. 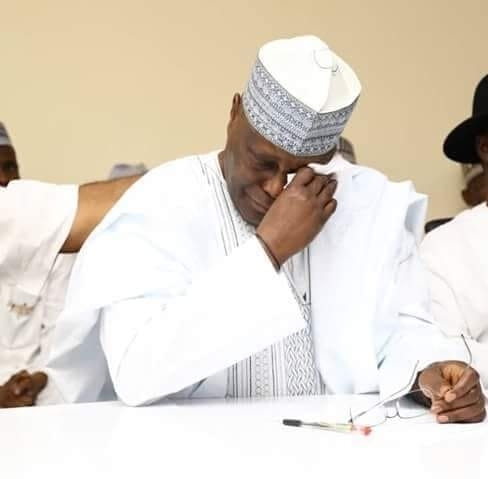 If Atiku and his Intels can withhold billion of Naira of revenue from Nigerian Port Authority (NPA) under Buhari, imagine, just imagine what Atiku will do to one of the biggest non-oil revenue agency in the country. And who’s going to check the established greed of Atiku when his Intels, as expected, starts defrauding NPA? Peter Obi? Don’t be silly. To the extent that corruption undermines revenue, it adversely affects government efforts to reduce poverty. Money that leaks out of the budget because of corruption will not be available to lighten the burden of the poor. Corruption damages society. Corruption matters because corrupt people corrupt other people. Corrupt Bishops and pastors corrupt the congregation and the entire society. Corruption breeds mistrust. And when citizens don’t trust their government, they stop being interested in it, stop participating in it, stop voting and stop demanding that it get better. And that makes government less efficient, less responsive and less effective for all of us. A strategic and sustainable response to corruption is public integrity. Integrity is one of the key pillars of political, economic and social structures and thus essential to the economic and social well-being and prosperity of individuals and societies. Atiku has been facing serious credibility problems especially in relation to integrity. He knows that his corrupt past and lack of integrity is harmful to a country’s economy, society, politics, and the overall environment. A President like Atiku Abubakar who lack this basic sense of integrity will undermine the fabric of our society and do great damage to our democracy. Yesterday, a primary school social studies teacher decided to test his students’ awareness of political development in the country. What is 1 +1? The teacher asked Aisha. Two, responded Aisha. Good, said the teacher. What is the sum of Buhari + Osinbajo? Slow but steady, responded the student. The teacher then asked, what of Atiku + Peter Obi? Corrupt dude trying to buy integrity said Aisha. What? Asked the teacher. What is rotten is rotten, you can’t buy integrity, Aisha said, without a flinch. The moral of this exchange is that even primary school pupils know that if you don't have integrity, you have nothing. They know that integrity cannot be bought. As adults, eligible to vote in the 2019 election, we should not let these kids down. So, as a Nigerian, I cannot in good conscience support Atiku even if he adds David Oyedepo and Apostle Peter as his VPs. Atiku is terribly corrosive and a master in the democratization of corruption that inclusion of Peter Obi in his ticket is irrelevant and deceptive. Do you believe Peter Obi can do what Obasanjo and the United States government could not? Think about it, deeply. You see, even “Saint” Peter Obi cannot restore Atiku’s battered integrity. What is rotten is rotten.